Deputy Chief Constable Drew Harris with (l-r) Chief Inspector Derek McCamley; Councillor Scott Carson, Chairman Lisburn and Castlereagh PCSP; Mr Adrian Donaldson, Director of Corporate Services, Lisburn and Castlereagh City Council and Chief Inspector John Wilson. The PSNI Deputy Chief Constable, Drew Harris attended the Lisburn and Castlereagh PCSP public meeting held in St Joseph’s Parish Centre, Carryduff. The meeting was organised to monitor the performance of the local police against the targets set in the local Policing Plan over the last year. The PCSP noted the crime outcome rate achieved by the Lisburn and Castlereagh District Command Unit in excess of 5% of last year’s figure reaching 37.2%. This sits in comparison to a 1.2% increase across the service as a whole. Around 80 people attended the meeting. The PSNI’s Roads Policing Unit detailed statistics relating to fatalities on the roads and the number of people seriously injured. 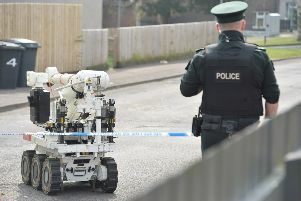 Chairman of the Lisburn and Castlereagh PCSP Councillor Scott Carson said, “The PCSP works tirelessly to ensure it engages with the community on policing and community safety issues and on this occasion it was a great success. However, the meeting revealed there were areas where targets had not been met. In the past year, there have been 639 burglaries across Lisburn and Castlereagh, which is the same as two burglaries per day an increase of 108 for the same period last year. The PCSP is aware that significant dedicated resources have been committed by the police to this; it is not having the desired effect of decreasing burglaries. Mr Carson said, “Tackling domestic burglary is a partnership approach and we urge all householders to take preventative measures, which in many cases is only making sure your property is locked.